It's around 10:35 pm at Off Broadway in Saint Louis, and I'm greeted heartily by a man who wants to be called Papa Joe. He's got a PBR tall boy in each hand, and although Whitey Morgan & the 78's haven't played a note, he asks me, "They great, ain't they?" Before I can respond, the band takes the stage and Papa lets out a howl. "St. LOUIEEEEEE," he yells. Papa has no time for me anymore, and he definitely isn't concerned about updating his Facebook or Twitter page. I'm not even sure Papa owns a cell phone. 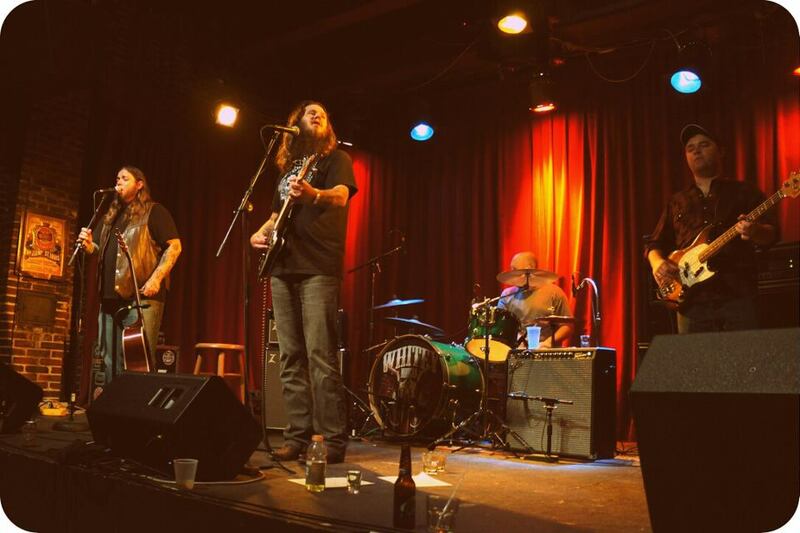 What I am sure about is this: if you're a live-music fan who often complains about inattentive crowds at concerts, then you need to see Whitey Morgan and the 78's. Or, just go to any show where country music is featured (or, if you absolutely despise country, then take yourself to a Bottle Rockets show). What you'll find is a group of people who are only concerned with a) the music being played and b) drinking as much as possible. As for the music part, they hang on every word, especially when Morgan belts out a tune called "Waylon's Still the King," where everyone hoots and hollers during the chorus (and, to a lesser extent, makes up their own lyrics). It's exactly the kind of reaction Whitey Morgan is looking for on this evening. (I am convinced of this partly because Morgan once said himself that his "job is to show you how much fun drinking is.") And Morgan's shows are indeed a good time. During the middle of the set, I approach Papa Joe, who hasn't moved from his spot in the back of the room, and ask how things are going. "Damn good time, my friend," he says. "Good people here, too." I can confrim Papa isn't a liar. I wish people who went to indie rock shows were more like the people at a Whitey Morgan and the 78's show. To be specific: I wish more people didn't go to concerts to be seen. As I stood by the bar for a portion of the evening, it was evident that PBR and whiskey were the drink staples of the night, minus that old-timey Stag bottle St. Louis musician Pokey LaFarge opted for instead. And when I say whiskey, I mean people ordering a shot, slamming it, and then impulsively ordering another before retreating back into the crowd. Whitey Morgan's show is sort of like that, too. I'd be shocked if the band follows any kind of setlist, or any loosest set of plans. Morgan started the show standing up, on electric, but then sat down for what was supposed to be a few acoustic tunes, which turned into about eleven or twelve. Perhaps he and the band were tired, as he later noted that they had been traveling in a van without A/C. Or, maybe he just wanted to keep a good thing rolling. After covering Bruce Springsteen's "I'm On Fire," Morgan remained sitting during "I Ain't Drunk," which might just be his best song, and he kept the fire alive with a snippet of Lynyrd Skynyrd's "Call Me the Breeze." Of course, the latter had just about everyone dancing and ordering their last round. Finally, right around two hours into his set, when it appeared Morgan had very little left in the tank, he asked into his mic, "We about done, hoss?" "Fifteen more," sound man Ryan Adams replied. Morgan didn't sigh, his eyes simply lit up. "Oh, we got time for a few more," he exclaimed. And then one of the oddest things happened: Morgan's merch attendant, Paul, hurried up to the stage and belted out the final two songs of the night. Not exactly what you saw coming, but no one seemed to mind; on this night at Off Broadway, all bets were off. And Whitey Morgan and the 78's drank and played until the last drop.